Sometimes small spaces are best places to have fun with decor and experiment with different design elements. If you follow me on Pinterest, you know that I love posting inspirational ideas that speak to many different tastes — whether you’re modern or traditional, minimalist or extravagant. Your space doesn’t have to be large to make a huge impact. Case in point? 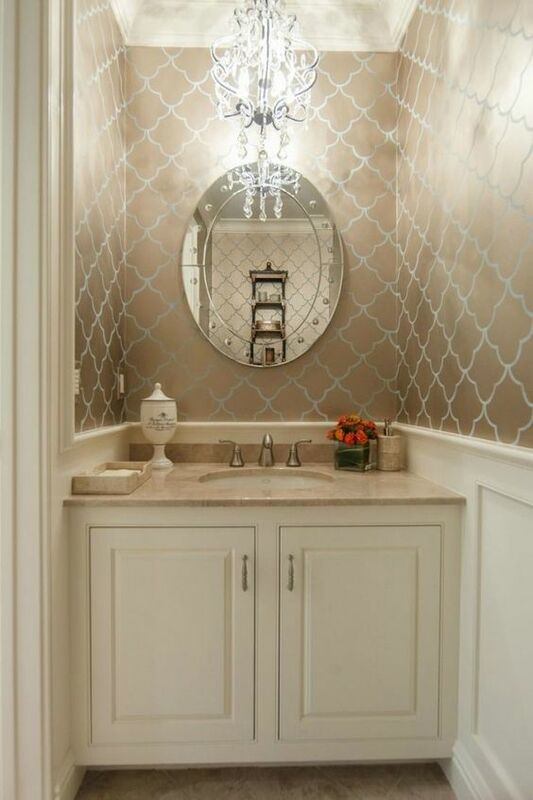 Check out these 6 powder rooms that make a statement. Great design really does come in small packages! 1. Feminine and moody. I’m not usually a fan of wallpaper, but a powder room is an excellent place to play with wallpaper. 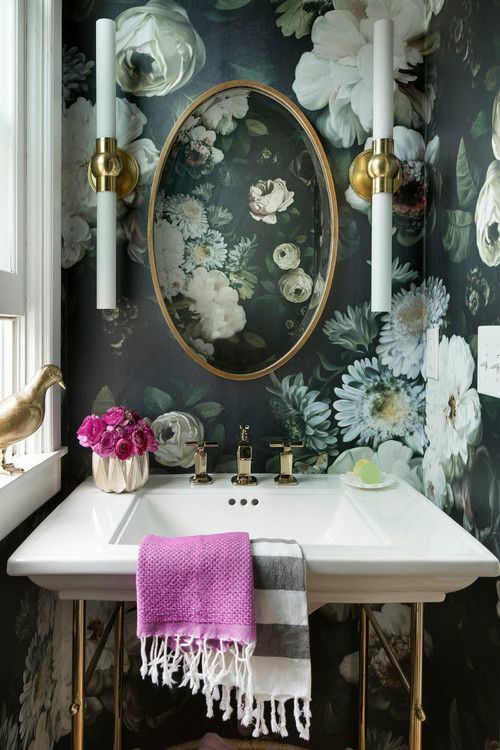 Check out this small space, featuring a dark, large floral print wallpaper. The print is large for such a small area, and I like how the designer used oblong side lamps and an oval mirror to add height and vertical length to the space. Contrasted with brass hardware and bright accessories, this is an eye-catching space. 2. Talk about texture. A textured wallpaper is a distinct way to add an element of interest to a small space. 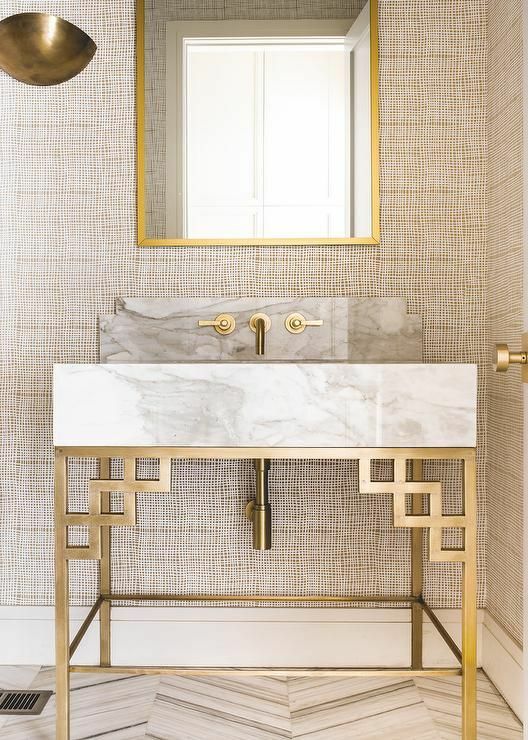 Complemented by other neutral elements — mirror, sink, hardware, — this textured wallpaper is distributed evenly on each wall, making for a uniform, regal space. Also, can we talk about how beautiful that sink is for a second?! 3. A way with wainscoting. 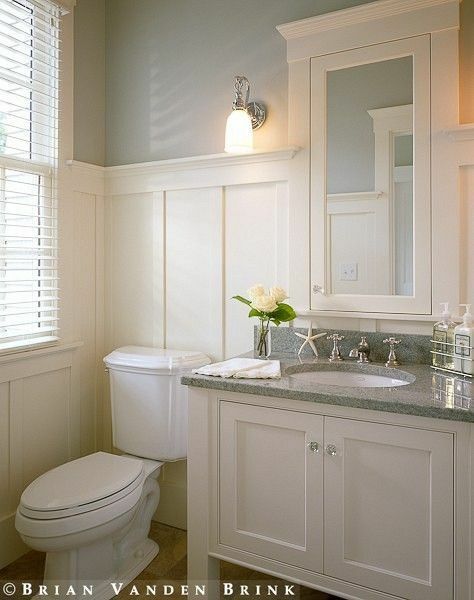 Light, airy, and soothing, this powder room is reminiscent of a beach house bathroom. I love the classic white wainscoting that flows right into a built-in behind-mirror medicine cabinet. 4. Statement chandelier. More than just fixtures and fancy wallpaper, it’s refreshing to see a designer take advantage of height and hang a statement chandelier. Especially in this space, where all four walls are finished in an iridescent wallpaper, the light from the chandelier adds brightness and depth. The countertop, hardware, and mirror are kept simple in comparison. 5. Dark walls and a fun ceiling. Why reserve wallpaper just for walls? 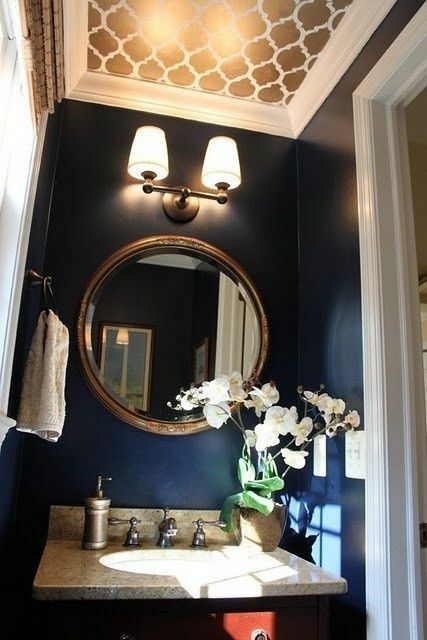 This powder room is a great testimony to the fact that you don’t have to reserve dark walls for a large room, and you don’t have to sacrifice style in a smaller space. I love the rich tones of both the walls and wallpaper choice for the ceiling. Framed by white crown moulding, it’s a classic look that won’t soon go out of style. 6. Shiplap. Shiplap need not be reserved for beach houses and cottages; this powder room proves that a little style goes a long way. You don’t have to get all ornate for a space to look great. 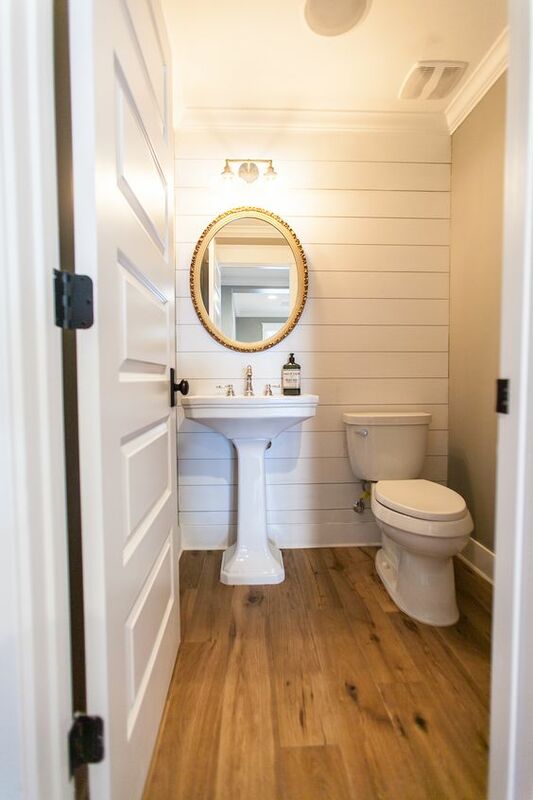 While this powder room features white shiplap, I’ve also seen spaces designed with black shiplap; your options are endless! If you’re looking for design inspiration and ways to update any of the rooms in your home, head on over and follow my For the Home board on Pinterest for ideas!